The impact of adult scoliosis on pain, function and health-related quality of life (QOL) has not been clearly defined. A population-based study using widely applied screening tools could better reflect the impact of adult scoliosis. 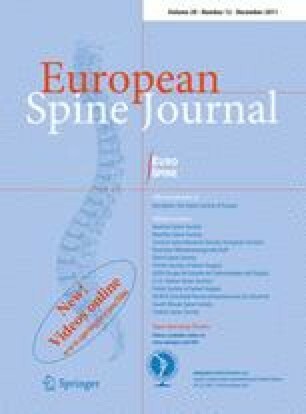 In this study, a visual analog pain scale assessment (VAS) for lumbar and leg pain, an Oswestry disability index (ODI) and a standard version of the Medical Outcome Study Short Form-36 (SF-36) questionnaire were sent by mail to 261 women of age 50 years and older, consecutively evaluated with dual-energy radiograph absorptiometry (DXA) scan images. 138 patients (32 with lumbar curves 10° or bigger) returned the questionnaires. Differences in lumbar VAS, leg VAS, ODI and SF-36 values between groups of patients with curves <10°, 10°–19° and ≥20° were evaluated. Correlation analyses of the Cobb angle, age and body mass index (BMI) with VAS, ODI and SF-36 values, and multivariate regression analysis were performed. Patients with curves <10°, 10°–19° and ≥20° had no significant differences in lumbar or leg VAS, ODI or SF-36 values. ODI values correlated with age and BMI; SF-36 values correlated with BMI only; lumbar and leg VAS values did not correlate with lumbar curvature, age or BMI. Regression disclosed that Cobb angle values did not influence ODI, SF-36 or VAS values. In postmenopausal women with mild and moderate lumbar curves, Cobb angle had no influence on pain, function and QOL; age and BMI had small effect. The authors thank Jose Romeo, PhD in Statistics, Department of Mathematics, Universidad de Santiago de Chile, for statistical support.